Xagave is the Sweet, Satisfying and Sensible" choice to sweeten your foods. The following outlines the key benefits of this wonderful sweetener. Sweeter than Sugar - Xagave is sweeter than sugar. In fact, it is 1.4 times sweeter than sugar so you use less to achieve the same level of sweetness. Saves Calories - Xagave can be used in all of your favorite recipes. Typically, you will substitute 1/2 cup of Xagave for every cup of sugar called for. Thus, Xagave saves between 25 to 40% in carbohydrate calories. In addition, the inulin permits the reduction of fats in baked items which significantly reduces calories even further. Tastes Delicious - Xagave is a great-tasting, natural sweetener. It is even being used by restaurants in beverages and sauces and is preferred over sugar. It has even been teenage-tested in Kool-Aid, Zucchini Bread and numerous other recipes without detection or rejection! Low Glycemic Index - Xagave is a very low glycemic index food. It is approximately 30 on the glycemic index scale. Anything below 50 is considered to be in the low category, which is recommended for a healthy diet. Xagave's low glycemic index also make it diabetic friendly. Contains Inulin, a Prebiotic Fiber - Xagave contains inulin, a prebiotic fiber, that studies have shown promotes healthy function of your lower intestine. It has also been shown to promote regularity, boost the immune system, increase calcium absorption and increase bone density. 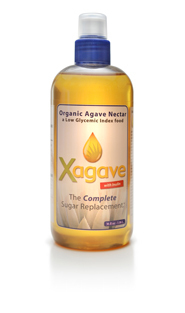 More Satisfying and Great for Dieters - The combination of low GI and inulin make Xagave a very satisfying sweetener. Unlike sugar, honey or high fructose corn syrup, Xagave does not spike blood sugar levels; thereby avoiding the highs and lows of sugar and corresponding cravings and over consumption associated with roller coaster blood sugar levels. Versatile and Easy to Cook With - Xagave is highly soluable in hot or cold water, making it easy to work with in the kitchen. It is a wonderful sweetener for coffee, tea and cereal. It is also an amazing sweetener for cooking, canning and baking as evidenced by the highly-rated recipes in Delicious Meets Nutritious" for jams, cakes, breads, salad dressing, desserts, cookies and sauces. In addition, the cookbook and Xagave.com have a Sugar Exchange Table that shows how to use Xagave in any recipe -- it truly is the Complete Sugar Replacement". Contains Calcium, Iron and other Vitamins and Minerals - Xagave is a natural and organic certified product, derived from the root of the agave plant. The nectar is processed, in order to prevent fermentation, at temperatures that do not exceed 117 which is considered "raw" by most standards. Xagave is not derived from an animal and is appropriate for a vegan diet. Due to its raw condition, Xagave retains its naturally occurring vitamins and minerals and has a particularly high concentration of calcium -- 17% of daily requirements in one (1) tablespoon.